"Mum! There’s a monster under my bed!" Gordon shouted. His mum came running through and turned the bedroom light on. "Gordon, there’s no monster," she sighed. "Come and look." He crawled out of bed and looked under the bed. "Now go to sleep and stop worrying. There is no such thing as a monster." "But Mum, I heard it breathing. It sounded horrible. I thought it was going to eat me," Gordon shivered. "I don’t know what you heard, Gordon, but it wasn’t a monster. You were just dreaming," she assured him. After kissing him on the cheek, she pulled the covers around him, turned the light off and went back to her room. Gordon lay in his bed, listening for sounds. CRUNCH! GROAN! SLOBBER! GRRRR! There it went again. He pulled the covers over his head but the noises wouldn’t go away. Remembering what his mum had said, he slipped out of bed and turned his light on. He stood, looking around. He walked over to his closet and opened it. There was nothing in there except his toys and his clothes. He dropped to his knees and lifted the covers. "HI!" the monster said, sliding out from under the bed. Gordon was about to scream when the monster put his fingers to his lips. "Shhh! Don’t be afraid. I won’t hurt you." Gordon didn’t say a word. He stared at the monster. 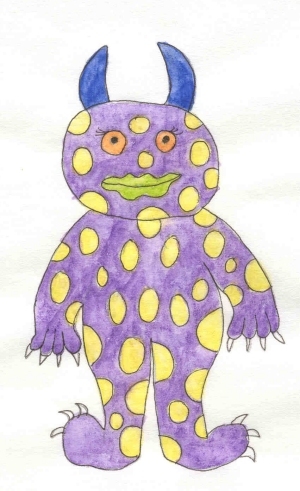 It was purple, had big yellow spots all over its skin, two fat horns sticking out of the top of its head, sharp claws on its feet and chubby fingers. Its lips were bright green and its eyes were orange. Gordon noticed a tear running down its face. "Why, why are you crying?" he stuttered. "I’m lost. I hope you don’t mind me hiding under your bed, but it’s warm there and I didn’t know where else to go," it slobbered. "Who are you? What are you?" Gordon asked, feeling less afraid. "My name is Keelin. I live in a cave near the loch. This morning I went for a walk. It was such a pretty day. I was chasing a big, black crow and the next thing I knew, I was lost. I saw your croft and thought I might find someone to help me get home," Keelin said. "But my mum looked under the bed and she couldn’t see you," Gordon said. "Grown ups can’t see me; only children can. Will you help me get home?" Keelin begged. "In the morning. I’m not going out tonight. It’s freezing out there. Go back to sleep for a while and I’ll help you when the sun’s out," Gordon said. "What sort of things to you eat?" Gordon asked. "I love grubs and oh, I think roasted crickets are delicious too, but my favorite food of all is crow. That’s why I was chasing it. I wanted to have it for my tea tonight," Keelin drooled. Gordon yawned. "I don’t have any grubs or crickets and I certainly don’t have crow, but if you promise to be quiet, I’ll go into the kitchen and see what I can find. Be quiet!" Gordon warned and tiptoed out of the room. The pudgy monster sat on the floor and picked up a rubber ball. He put it in his mouth and tried to chew it. "This is horrid," he moaned and spit it out. He started biting his claws. Gordon came back carrying a plate of food. "Here, you can eat this," he said, handing it to Keelin. "What is it?" he asked, looking at the food. "It’s sausages and beans and boiled potatoes," he answered. Keelin put the whole plate in his mouth. "Wait!" Gordon said. "You aren’t supposed to eat the plate too." But it was too late. Keelin chewed and crunched the whole thing. Gordon stood still, watching Keelin’s face. "That was good." "Go to sleep now," Gordon sighed. He climbed into bed and pulled the covers up. Keelin climbed under the bed and fell asleep. He made all kinds of noises, he snored, he moaned and groaned but Gordon wasn’t afraid any more. When he woke up the next morning, Keelin was still asleep under his bed. Gordon grabbed hold of one of his plump toes and pinched it. "Time to get up and get you back to your cave." Keelin yawned and stretched. His tummy growled and the bright yellow spots on his skin turned even brighter. Gordon laughed. Keelin stood by the window as Gordon opened it wide. "Come on, Keelin. Let’s go," Gordon called. He jumped on the grass and the monster followed. They walked through the glen towards the loch. A bumblebee buzzed past them. Keelin tried to grab it with his hands but missed. Two pink butterflies fluttered from thistle to thistle. Keelin reached for them but missed and grabbed hold of the thistle. He shouted, "OUCH!" as the prickles dug into his skin. A crow flew high above them. "I’m hungry," Keelin pouted, seeing his breakfast flying out of reach. "There’s the loch," Gordon pointed out. "You’re nearly home. What side of the loch is your cave on? This is a big loch!" Keelin looked from side to side. "I don’t know. I think it’s over there, at the bottom of the hill, but I’m not sure." The boy and the monster walked around the whole loch until they finally came to a cave. "Is this it?" Gordon asked. Keelin went inside to look. He came out smiling, "This is it! This is my cave. Would you like to come in and see where I sleep?" Gordon shrugged his shoulders and went into the cave. It was dark and the inside of the cave walls were covered with emerald green moss. There was a pile of dried heather on the floor. "Is this your bed?" he asked. Keelin nodded. "I have to gather twigs to build a fire. I sit right here," he pointed, and roast my crow or grubs and crickets over it. Would you like some? I’ve got a pile of grubs right here," he said, reaching over and picking them up. "That’s all right, Keelin. I am not hungry," Gordon swallowed in disgust. "Well, you’re safe and sound back home. I think I’ll get back to my house now. Try not to get lost again," he smiled. Gordon waved goodbye and headed back home. Later that night, as he lay in bed, he heard a noise under his bed. He was about to shout for his mum, but decided to look for himself. There was a monster. It wasn’t Keelin though. "Who are you?" Gordon asked, "and what are you doing under my bed?" A skinny gray monster climbed out from underneath. It had long arms and legs, huge ears and a long pointed nose. Its eyes were blue and on top of its head was a tuft of lime green hair. "I’m Brogan. Keelin told me if I ever got lost, to come to your house and you’d help me find my way home. Please help me. I’ve never been lost before!" the monster pleaded. Gordon sighed. Every night from then on a different monster showed up under his bed. He didn’t shout, he didn’t cry and he didn’t call for his mum. When he woke up, he always had to help them get back home. He met orange monsters, black monsters, green monsters, pink monsters and once he even met a tartan monster! Soon he knew every monster in the glen. It didn’t take long before he knew what they all ate and where they all lived.